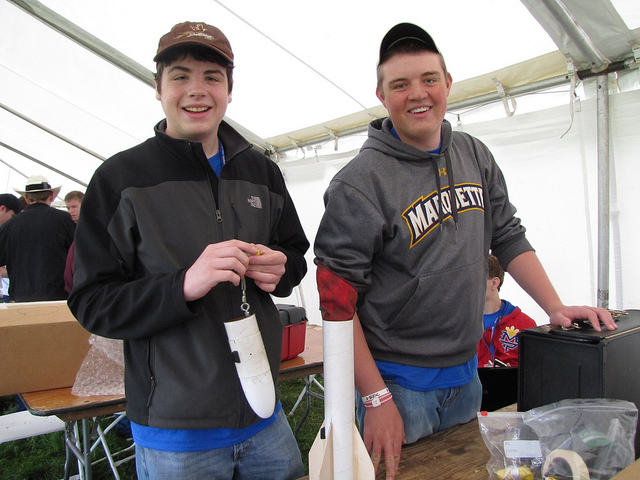 October 21, 2014 – Registration for the Team America Rocketry Challenge (TARC) is now open for teams of 7-12th grade students through December 12. TARC is the U.S. aerospace and defense industry’s flagship program designed to encourage students to pursue study and careers in science, technology, engineering and math (STEM). Structured to emulate the aerospace industry’s design, fabrication and testing process, TARC requires teams to build and fly a model rocket that meets challenging design requirements and precise targets for altitude and flight duration. Each year, TARC’s rules and scoring parameters change to challenge the students’ ingenuity and encourage a fresh approach to rocket design. This year’s rules require teams to build and launch a rocket carrying a raw egg to 800 feet and return it to Earth uncracked within a flight duration of 46 to 48 seconds. A new requirement this year calls for the rocket to separate during flight, safely returning the motor and the egg to the ground detached from one another in separate segments of the rocket. The 100 top-scoring teams from across the country will be invited to compete in the National Finals in Washington D.C. next spring. The winners will then represent America in the International Rocketry Challenge, competing against student teams from the United Kingdom and France at the Paris Air Show next June.